If you own a high-end laptop, chances are you relish your gaming mobility. Being able to haul that puppy from house to house, from MOBA tournament to FPS showdown is exactly what you paid for. So what else do you need in your bag? Definitely a mouse, maybe even a slick mousepad. How about a headset? You need something that can localize enemy footsteps, and stand up to being shoved in a case with your Razer Blade or Series 7 Gamer laptop. That's exactly what the Steelseries Flux was designed for. A durable, comfortable headset with a chat mic built into its heavy gauge rubber cables, it'll keep up with the on-the-go gamer, and help him keep up with his team. At a reasonable $99/£79.99 for the basic set (Luxury version comes with extra accessories), it's hard to argue with the Flux. 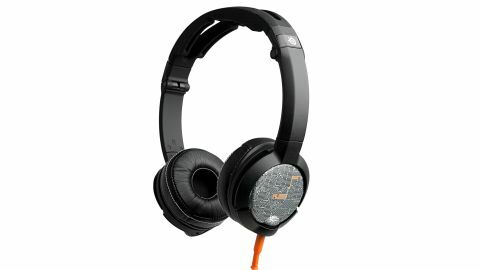 Spend a litte more on a bulkier headset and you can get some more auditory oomph - the Sony DR-GA100 and Creative Sound Blaster Tactic3D Wrath come to mind - but not one that's going to travel light and take a beating like the Steelseries Flux. And thanks to in-line pause/play controls and a hidden microphone, it can double as a decent pair of headphones without making you look like a telemarketer. Other than the box's suggestion to "Flux yourself," the first thing you'll notice when unboxing this new headset by Steelseries is how springy and malleable it is. Built with several points of articulation, it's made to stretch and flux-tuate. Aesthetically, the Flux is a bit bland. It's available in either solid white or black with matching cables. You can spice things up, thanks to swappable magnetic faceplate on the ear pieces, but that requires further investment. Steelseries sells plates and ear cushions of different patterns and colors on its website.